Why should you replicate your websites? A well-defined, strong web presence makes generating leads simple. Replicating Website Software makes it easy for you to quickly replicate your website! Home Office Pro offers both packaged replicating website software, as well as complete custom solutions to better assist you as you replicate your website. Our lead capture page designs are customized to target the leads you need to best grow your business. Our skilled team of arketers, designers, and programmers ensure that your experience working with us is both memorable and profitable. 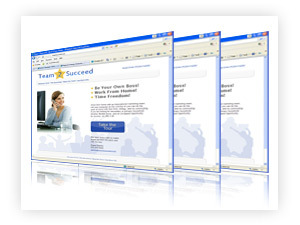 Your replicated websites allow you and your business partners to easily duplicate success!